Computers in the home are obviously very common these days and it’s not unusual to find more than one Windows PC or laptop in a household. Perhaps the parents have the desktop PC and the kids use a laptop or you have desktop machines networked together in your office for work. With the increase in computers at your disposal comes an increase in looking after them when they developed a problem, need tweaking or don’t work as efficiently as they should. One of the ways to work on another computer without physically being in front of it is of course via networking. Besides the obvious of being able to read and execute files on a remote computer or transferring files between computers, you can also perform more advanced maintenance tasks such as starting or stopping remote processes and even controlling Windows Services to be started, stopped or completely disabled. Here we’ll show you some ways to view the status of Windows Services on a remote computer in addition to having the ability to start and stop them without leaving your own computer. 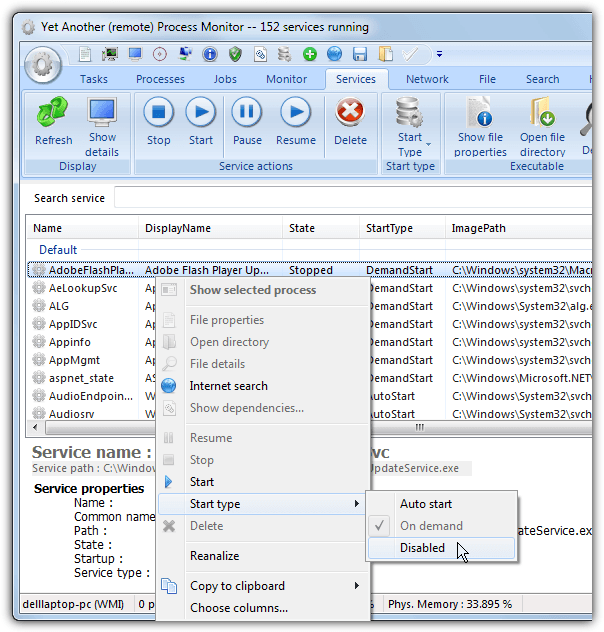 This program is getting old now and hasn’t been updated since 2009, but don’t let that fool you because YAPM is one of few tools that can actually let you manage remote services from the comfort of a GUI. We have talked about the program before because of the remote process handling abilities, but it’s equally at home controlling services. YAPM allows you to view the services and their details on the remote machine, and offers control of starting, stopping or changing the startup type. 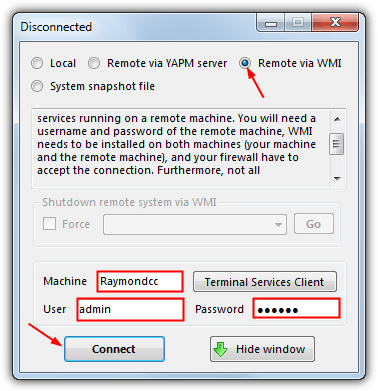 There are two ways to remotely connect to another computer, either via the WMI interface which is easier, or launching a YAPM server process on the remote machine. The latter has the drawback of needing the YAPM.exe permanently running or being manually launched on the remote machine. For ease of use we’ll show the WMI option. Run YAPM and click the round Options button near the top left of the window, select “Change connection type” from the menu. This will bring up the connections window shown below, click “Remote via WMI” followed by Disconnect and then enter the remote computer name/IP address along with the remote admin’s username and password. Finally click Connect and then Hide window. Go back to the main window and select the Services tab, after a few moments you should see all the services on the remote computer (press refresh if not). Now you can get details for and control the remote services as if they’re on your own machine with buttons or context menu options to start, stop, set to autostart, on-demand startup (manual) or disable from starting. A web search option is there if you don’t recognize the service. A-A-S is an old tool that actually boasts several powerful features, but sadly it can be tricky to use and the official documentation is of very little help. With the ability to launch Windows applications and enable/disable services remotely over the internet as well as local network, A-A-S has good uses but the major drawback is it needs to be configured and run entirely on the remote computer. To get up and running quickly you don’t need to configure that much. First run the program, click Configure > User, highlight user admin in the list and click change. Replace the password and optionally the username, click OK twice. Press Start to launch the web server. You will then be asked to enter the username and password of the user edited above. The web interface will then show, to view the services on the remote computer click the Services option on the left. The window will display the services on the remote computer along with their current status. Do note that Stopped also means disabled in addition to not running, for this reason when you press to Start a remote service it might not actually start because it’s startup state is set to Disabled. Manual or Automatic will accept Start/Stop requests, Pause will most likely fail. A-A-S offers extra security measures such as Silent or Stealth port options, Silent requires a keyword appended to the IP and port while Stealth uses a separate AAS_Login.exe tool. Services can also be started and stopped using command line tools like Net or SC, this can be done in the Application configuration window. Do not enable “Accept registered hosts only” in Security configuration as it seems to block all addresses totally and you won’t be able to remotely access A-A-S. 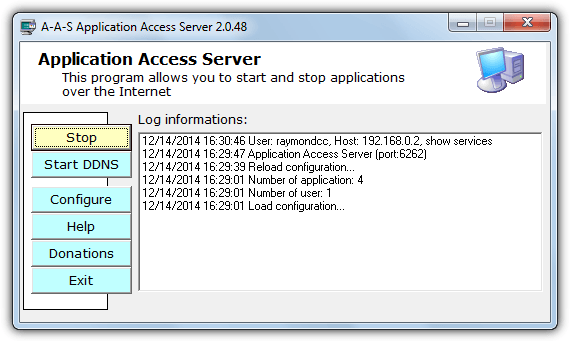 Although the Windows Control Panel Services window has an option to connect to a remote computer, it’s not easy to get working because you aren’t given an option to enter a remote user’s credentials, so you ordinarily need to be part of a domain for it to work. The Windows built in SC command also suffers with the same problem because it’s simply a command line based version of the Services MMC snap in. Note: The single space after the “=” is important! The above screenshot queries the Windows Update Service, starts it and then queries it again to make sure the service has started. More information on how to use the SC command can be found at Microsoft Technet or third party sites like SS64.Com. The full list of syntax and arguments can be found in the included help document or on the SysInternals website. Windows has more than one name for each service, the “Service name” and the longer “Display Name”. For example, “Windows Update” is the display name for the Windows Update Service, “Wuauserv” is the service name. 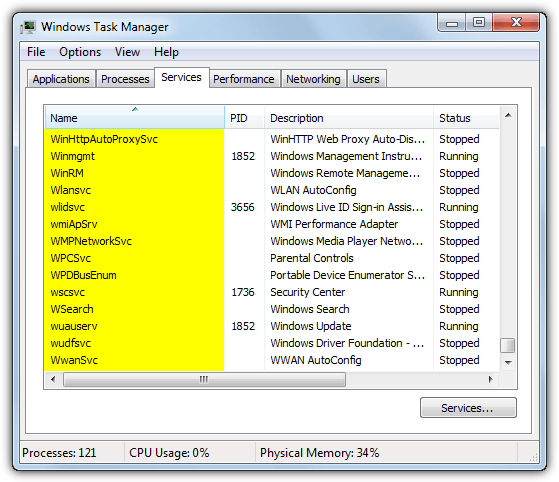 The easiest way to use these tools is with the shorter service name, you can find names for services on your own computer if you’re not sure, simply open Task Manager and go to the Services tab, the Name column gives the name you need to use. Alternatively you can use the Control Panel Services applet (Services.msc), double click the service to find the name near the top. 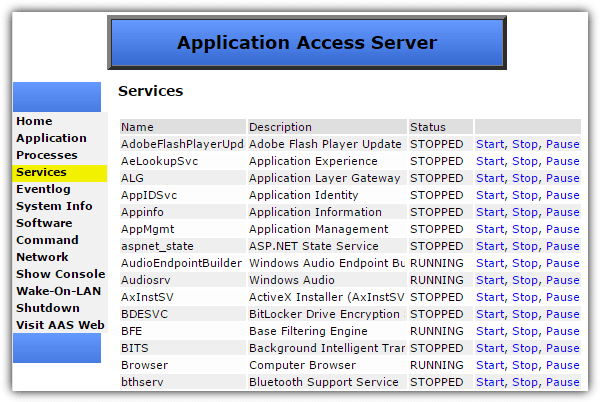 A useful resource for Windows Service information including names is BlackViper.com. 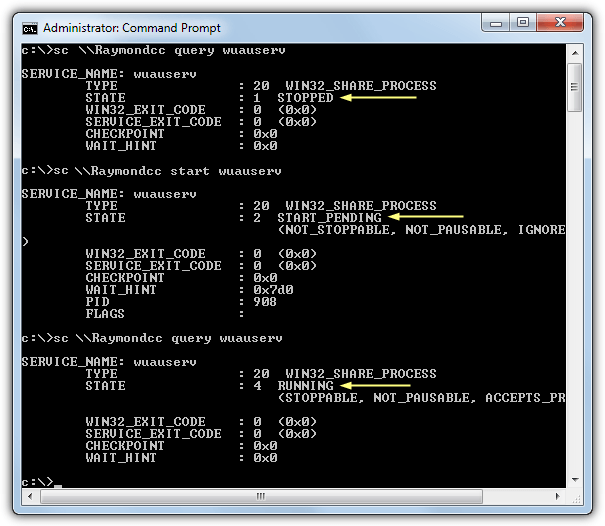 Another way to achieve this is to use WMI Query, PowerShell script or wmic tool. PowerShell is really powerful. You can use it to query services from all remote computers in your domain, filter and sort list of services. You can easily combine this with the commands described in this article to be able to start/stop services. What a nice explanation. You helped me to resolve a tough issue. Thanks so much for this effort. It did me great. Thanks, this software is fantastic !!!!!! Thanks for the nice article Raymond. I always learn something new here. Thank you Raymond. I have gone and got it but haven’t got the first idea how to use it but I will when I get a manual to teach me ! Yet another super duper fun tool. Your wisdom is helping me always to expand on my knowing. thanks raymond this is nice!